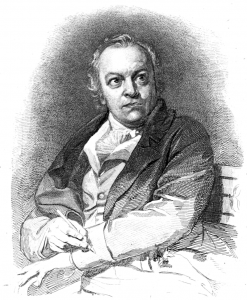 William Blake was an 18th-century poet, printmaker, and painter. Blake, now considered one of the founders of Romanticism, went largely unrecognized for his literary and artistic contributions until after his death. Both Blake’s artwork and poetry exhibit his creativity and individuality, showcasing his strong spirituality, unique mythology, and strong political opinions. Romanticism was an artistic and literary movement, which is often described as starting in 1798 with the publication of Lyrical Ballads by William Wordsworth and Samuel Taylor Coleridge. Romantic works revolt against the conventional strictness of neoclassicism and place emphasis on imagination and emotions. 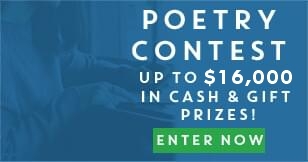 Romantic poetry focuses on thought, feeling, and creativity of the individual. Born November 28, 1757, in London, England, Blake was the third of seven children. He attended school briefly, to learn reading and writing, but after he turned ten was primarily educated by his mother. He began writing poetry as a child. His artistic talent was obvious from childhood and his parents sent him to drawing classes. Blake appreciated Classical artists, rejecting popular trends of the time. Around nine years old, Blake reported to his parents a vision he saw of angels filling a tree, but he may have experienced his first vision as young as four. He had visions throughout his life, most of which were religious in nature. He often claimed figures appeared and sat for him to draw. In August of 1772, fourteen-year-old Blake was apprenticed to James Basire, an engraver. Basire’s style of printing was considered old fashioned but fit Blake’s propensity for strong lines. A few years into his seven-year apprenticeship, Basire sent Blake to London churches; studying the tombs and monuments for copying sparked Blake’s lifetime passion for Gothic art. Upon completing his apprenticeship, Blake worked as a commercial printer while pursuing his own creative calling; he began attending the Royal Academy of Art’s Schools of Design in 1779. In August of 1782, he married Catherine Sophia Boucher, an illiterate woman whom he taught to read and write and, later, to engrave. He also shared the experience of his visions with her. She was supportive of his work throughout his life. Blake’s first publication, Poetical Sketches, was privately printed in 1783 and contained poems written over the previous fourteen years. Blake expressed a variety of ideas through his poetry including political beliefs, religious exaltations, and personal philosophies. His deep symbolism and private mythology make his work harder to digest than other Romantics and contribute to his belated notoriety. His published books are a combination of prose and poetry and demonstrate the breadth of his study and reading. Around 1788 Blake developed a printing process called relief etching where text and images could be printed together, expediting the publication process. He wrote and drew on metal (like copper) with an acid-resistant substance, and after applying acid, the metal plate would retain the text and drawings. Many of Blake’s most notable works were printed in this illuminated process, which coupled inception with production. Catherine helped with engraving and the finishing watercolor work. Blake created the illustrations for Mary Wollstonecraft’s Original Stories from Real Life, published in 1791, which challenged contemporary ideas of women as merely emotional, irrational creatures. Blake failed to gain notoriety in life, frequently dismissed by critics and the public for his idiosyncratic personality. He suffered from an unidentified disease, but judging by the ailments he described in letters, his affliction was from the persistent contact with by-products released during the exposure of copper to acid. He died on August 12, 1827, working diligently up to his death. Catherine remained by Blake’s side; he died less than a week before their forty-fifth wedding anniversary. This entry was posted on Tuesday, October 21st, 2014 at 12:00 am. Both comments and pings are currently closed.